Easier to control clutch and brake! 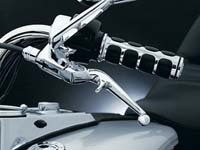 OB-CC, OB-BB: The ability to adjust clutch and brake lever locations to suit the size of your hands is extremely important for riding comfort and safety. 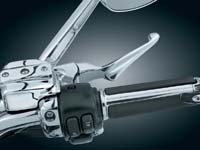 With these premium levers designed to fit the Harley Davidson model line this adjustment is achieved by a fingertip controlled knob offering eight positions which allows more than 1 inch of adjustment. This is extremely useful with bikes equipped with a hydraulically actuated clutch and for people with smaller hands or limited mobility. The unique re-dial cam design achieves this extraordinary adjustment range with ease due to its close tolerance design. The internal adjustment cam is hard anodized for longevity, reliability, and smooth adjustment transition. Offered with a Black Anodized finish or a highly polished Chrome finish. ​Fits virtually all Harley models from years 1996 through current. Special order item. ​Note: if the clutch lever is adjusted to a setting very close to the grip, in some circumstances it can cause the clutch to not fully disengage and/or defeat the start-in-gear function, if this is a concern please contact Hogleverage for advice. Lever length is approximately 7" from center of pivot point to end of lever ball and is comparable to the standard lever. These levers include an aero slot. Installation is relatively straight forward for anyone with moderate mechanical ability and certain hand tools. Included with the levers is a one page instruction sheet which references the bike workshop manual. Care must be taken to avoid damage to delicate microswitches. Also it is extremely important, where applicable, to move the pivot bushing and any anti-rattle shims from the original lever to the Oberon lever. This step is often missed, especially by experienced mechanics who tend to ignore instructions, and will result in less than desirable results. PS-2022: Adjustable levers for V-Twins. Easily adjust lever to bar reach for individual riders. CNC machined from high quality aluminum. Available in black, chrome. Sold in pairs. Fits Touring per model year: '14 - '16 FLHTCU/FLHT/FLHR/FLTR/FLHX. PS-2022T: Similar to above for '08 - '13 FLHT/FLHR/FLHX & H-D FL Trike. 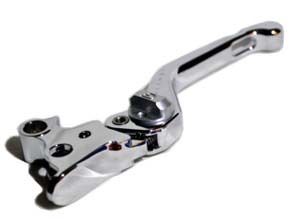 SB-LEC: Reduced reach clutch lever. Reduces reach 1″ less than stock, smoother, easier operation. Great for riders that are use to the older cable clutches or with smaller hands. Available in black, polished or chrome. 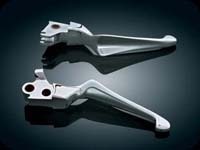 Customer to supply exchange of polished or black clutch lever(s) upon delivery of their new Reduced Reach Lever(s), using the supplied Return Label and Packaging. Deposit required and will be reimbursed when the exchange lever is returned. Made in the USA. SB-LEB: Similar to above but for the brake side. DD-80: Our levers just got better! All the style and comfort of our Boss Blades with the addition of an adjustable clutch lever! Our unique design relocates the cable anchor point to allow the lever to be adjusted closer to the handlebar without affecting clutch actuation. Fits:’96-’13 H-D Models with Cable-Operated Clutch (except ’04-’13 Sportsters, ’08-’13 Electra Glides, Road Glides,Street Glides, Road Kings, & Trikes). 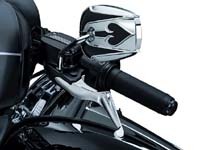 Also fits the 2012-2013 Harley Davidson FLD Switchback. 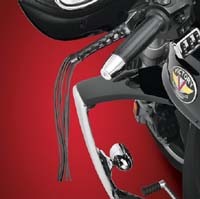 KB-99: These foam lever sleeves slide over the brake and clutch levers providing gentle comfort. Black. Fits Most Brake / Clutch Levers. 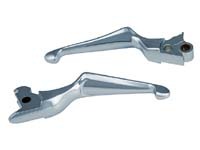 Slim Levers: These levers are slimmer and make it easier to operate the clutch and brake. The slimmer design allows you to hook your finger over the lever easier. 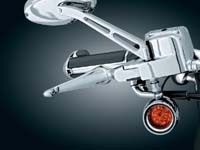 The product also incorporates innovative needle bearings in the pivot to reduce friction for smoother operation. Trigger Levers: Your forefinger is your strongest finger. These levers allow the forefinger to get a real grip, making it much more comfortable and easier to pull the lever. Add to that the dished out backside of the levers, makes them very ergonomic. Your hands just fall naturally into place. If you've got small hands, these are a must. Deeply Dished Levers: A stunning addition to our line of custom levers. Their wide, deeply dished blades greet your fingers with the shortest reach possible while still allowing the necessary range of motion. DD-23: A stunning addition to our line of custom levers. Their wide, deeply dished blades greet your fingers with the shortest reach possible while still allowing the necessary range of motion. Fits: Following Models with Hydraulic Clutch:'14-'15 Electra Glides & Street Glides, '15 Road Glides, '14 FLHRSE CVO Road Kings. DD-85: Fits: '17-'19 Electra Glides, Road Glides, Road Kings & Street Glides, in black. DD-86: Similar to above but in Chrome. DD-OE: Fits: '14 - '16 H-D Touring. 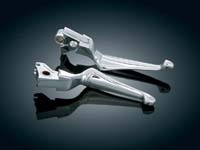 OEM Polished Dished Levers. Hydraulic clutch and brake. LL-17: It is the simple things that make the difference! These Leather Lever Laces have been around forever, but they have found a way to improve them. A thicker leather material gives these Leather Lever Laces a fresh look and firmer feel.These 1 ¾’’ x 4 ½’’ leather grips have 12’’ long laces that cover and hang from your levers. They lace over the brake and clutch levers. Sold as a pair. Fits Most Brake/Clutch Levers, 1 3/4" x 4 1/2" Wide, 12" Long Laces.